Spanish rabbi and author; lived at the end of the thirteenth century and at the beginning of the fourteenth. He was a pupil of Solomon b. Adret, and left in manuscript a work, "Ẓeror ha-Ḥayyim," which contains the laws concerning the services for Sabbaths and festivals. Some passages of that work were inserted by Jacob Castro in his "'Erek Leḥem." 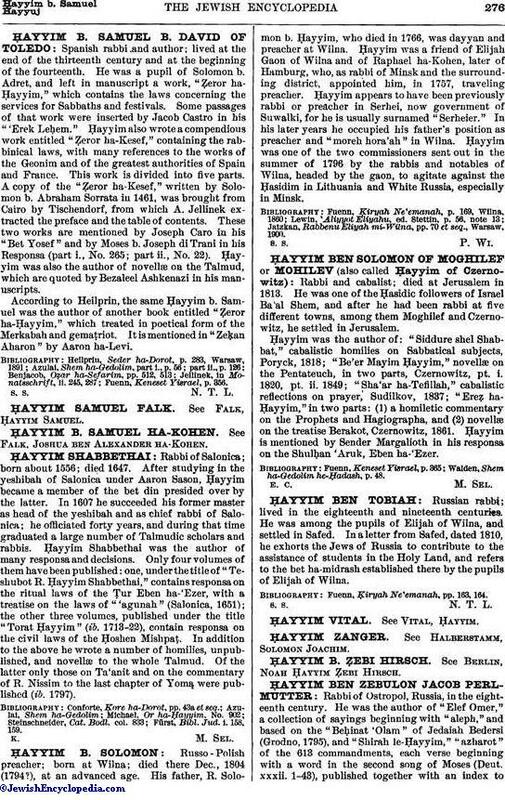 Ḥayyim also wrote a compendious work entitled "Ẓeror ha-Kesef," containing the rabbinical laws, with many references to the works of the Geonim and of the greatest authorities of Spain and France. This work is divided into five parts. A copy of the "Ẓeror ha-Kesef," written by Solomon b. Abraham Sorrata in 1461, was brought from Cairo by Tischendorf, from which A. Jellinek extracted the preface and the table of contents. These two works are mentioned by Joseph Caro in his "Bet Yosef" and by Moses b. Joseph di Trani in his Responsa (part i., No. 265; part ii. No. 22). Ḥayyim was also the author of novellæ on the Talmud, which are quoted by Bezaleel Ashkenazi in his manuscripts. According to Heilprin, the same Ḥayyim b. Samuel was the author of another book entitled "Ẓeror ha-Ḥayyim," which treated in poetical form of the Merkabah and gemaṭriot. It is mentioned in "Zeḳan Aharon" by Aaron ha-Levi. Fuenn, Keneset Yisrael, p. 356.